LadyLuck’s Casino have just launched their first multiplayer casino game: Head2Head Poker. There’s something that bit more compelling and that much more thrilling when you’re gambling against a real-life person and not some sort of a computer bot. LadyLuck’s know this as well as anyone, and that’s why they’ve developed a new gaming platform that allows players to compete head to head over their mobile phones quickly and easily. They’ve named the system Zaphod, and the first game to be available on it is a one-to-one mobile Texas Hold’em Poker called Head2Head Poker. Big Hasbro titles like Battleships and Trivial Pursuit are to follow on LadyLuck’s Mobile Casino later this year. Head2Head Poker will allow users to find a match in seconds on their phone using the Zaphod system and then battle it out for as little as £1 a game. Check out our review of the LadyLuck’s Mobile Casino. 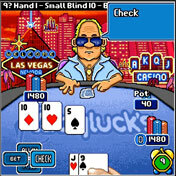 Other casinos offering multiplayer games include mBet, Aces Royal Poker, and Foxy Mobile. This is a great game – I wish there were more people to play with….come on pokerheads!! !